It’s that kind of game that just scrolls from left to right and plays for you, while you try to avoid obstacles. Like Flappy Bird. Only deadlier. 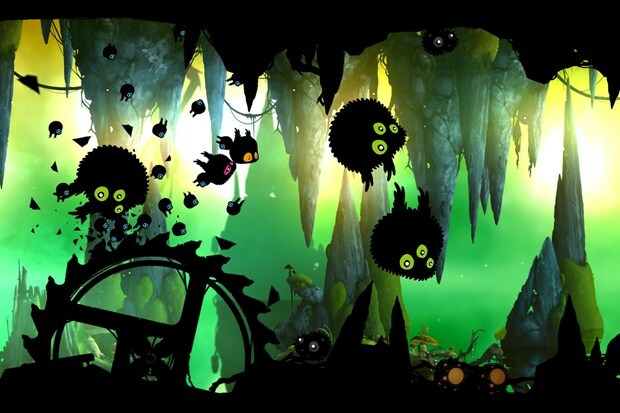 BADLAND starts off straightforward enough: you play a little flappy, fluffy hedgehog-like creature with small feeble arms/wings, attempting to navigate through this left-to-right side-scrolling world. Like Flappy Bird, where you need to flutter your way through the stage, only if you hit anything, or the ground, you don’t necessarily die immediately. The game plays akin to Limbo, as the stages are silhouette in design, with background level design that will barely even register, and ominous, atmospheric music in the backdrop. The goal of each stage is to get to the end, which is a large vacuum tube. There is no story. The stage itself is the main obstacle, as it moves left-to-right, and it may eventually push you off the screen, ending that run, if you get snagged. The levels, except for the speed runs (needing to be completed in one life), will have checkpoints if you do happen to die. As a physics platforming puzzle game, aside from the navigation alone, with the constant threat of the left hand side of the screen, there are spiky plants, lasers, bombs, and blades all trying to ruin us. As with other platformers, there are occasional switches. These activate walls, or turn off the blades, or switch the gravitational pull, and sometimes, these switches are on different paths. Later in the levels, portals will also be introduced. This brings us to the main power-up: cloning. Throughout each stage, there are plenty of grab-able power-ups. The main one is the clone function, but others will increase the speed of the stage or slow it down, will make our little fluff ball tiny, or heavy and huge. Some will make us sticky to the level, or bouncy, or even turn us square. Others will make us automatically spin, continuously, as these will help us navigate through circular mazes or roll along speedy parts of the stage, so that we won’t get left behind. What doesn’t kill us definitely reduces our numbers. All the power-ups are appropriate to that section of the stage, never going unused. Cloning is by far the most important though, and most impressive part of the game. As we start with one, the stage can quickly get populated upwards to 2, 5, 20, 30 of us, trying to navigate the minefield of death. The main purpose of the cloning is not necessarily to get them all to the end of the stage – although that is, unto itself, a goal to get as many as possible – but as sacrificial fodder to get through the next section of awful. Strength in numbers, as only one lucky flappy ball needs to make it through. Some stages will involve clone puzzles, where there’ll be 4 paths, each ending in a switch that will open a door for one to make it through. Sacrifice is key in these cases. The game really comes together in an impressive feat when you have 30+ clones on the screen, in slow-motion, getting bounced around and shot at by cannons, surrounded by spinning blades, just trying to survive, slowly watching our many, many clones explode into feathers. Even the slow-motion sound effects add to the awesome. The game has four worlds: Day I, Day II, each made up of 40 levels, and a Daydream world, and a Doom world, each made of 10. Each level also has 3 missions. These are similar to the stars in Angry Birds. These level specific challenges mainly require getting to the end of the stage in one life, or with a specific number of clones. Day I and Day II are split into 4 zones, 10 levels each: Dawn, Noon, Dusk, and Night. Each section displays different background art styles, introduces new power-ups, and harder puzzles. And the Daydream and Doom levels really mix it up, with modifiers to either the flappy hedgehog, or the whole stage, and increase the difficulty ten-fold. For example: some stages will have light timers or light switches. Each world is also available as a couch co-op mode. In co-op, there are slight modifications to the puzzles, but these are barely noticeable. Playing in co-op, the puzzles are sometimes easier, as you can play with up to 4 players. So, for example, when you start to come up upon a path split, you can communicate, instead of trying to manage 4 spinning monsters simultaneously. Other times the stage gets complicated, as we’re bouncing off each other, crashing into walls, and losing, or getting stuck, jammed against one another in a tiny gap, and losing. So, yes, sometimes co-op can be a hindrance. Communication and sacrifice is key, as certain parts of a stage is timing related, and it’s meant for one flappy hedgehog only. If your buddies do die, the cloning power-ups will bring them back to life. Lastly, there’s a couch multiplayer mode as well, which is survival of the fittest. Whoever makes it longest, through the stage, wins the most points. Again, supporting 4 players. 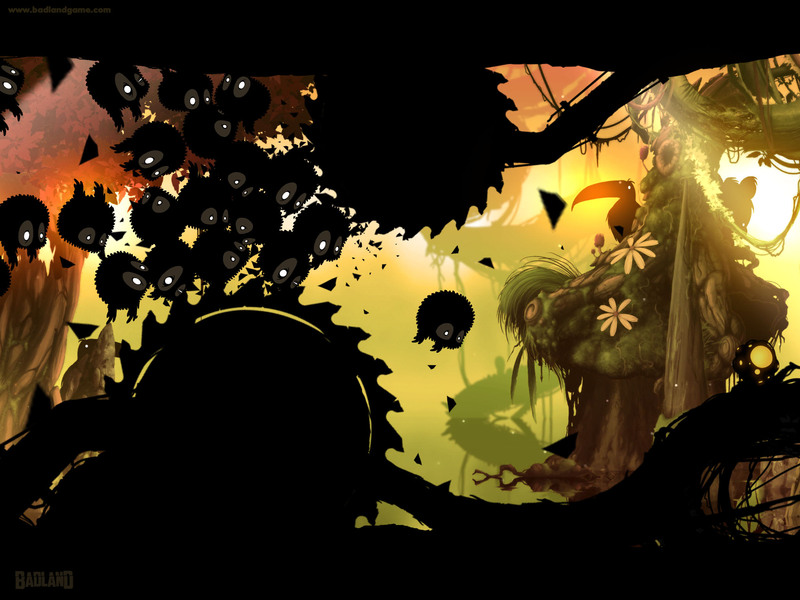 BADLAND is a lot of fun. It’s satisfying, and equally frustrating at times. It’s a great multiplayer platformer that doesn’t require too much brain work to figure out the puzzles, but you’ll watch yourself die – or you’ll watch a lot of yourselves die. A lot. Many of the achievements are completionist achievements: completing each level/world, saving clones in single-player or co-op, and completing the stage specific missions. All of these will require many, many playthroughs . . . but the secret achievements are where it’s at. This entry was posted in Reviews and tagged BADLAND, Cloning, Flappy Bird, Games, Gaming, Hedgehog, review, Video Games. Bookmark the permalink.